Our modular AV-Drop system is an extremely solid and cost-effective alternative made of resistant aluminum and fabrics. AV-Drop is a compact and fully reusable system, designed to be swiftly setup and dismounted easily by combining a very reduced number of pieces and parts. We work on custom-made projects to bring our clients the best solution. With AV-Drop you get the possibility to create different backdrops of multiple sizes, putting pieces together. It’s Lego-like, this modular structure offers endless possibilities, so your company can customize it for each event. Depending on the available space, choose width and height for the backdrop. Do you want any logos or info printed on it? We can do that for you. Just use different fabrics to change the color of your backdrop. Place any number of screens for adding multimedia to your event. 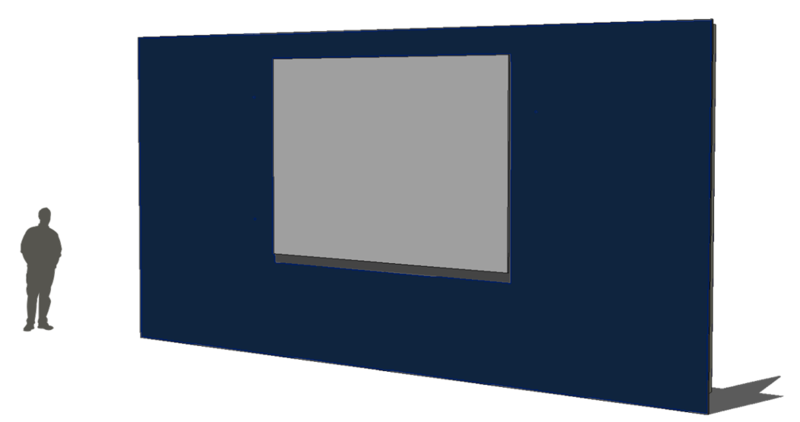 Decide screen size and if it will be rear or front projection. 4: CONTACT US AND GIVE US THIS INFORMATION, YOU WILL GET PRICES AND MORE USEFUL INFO.